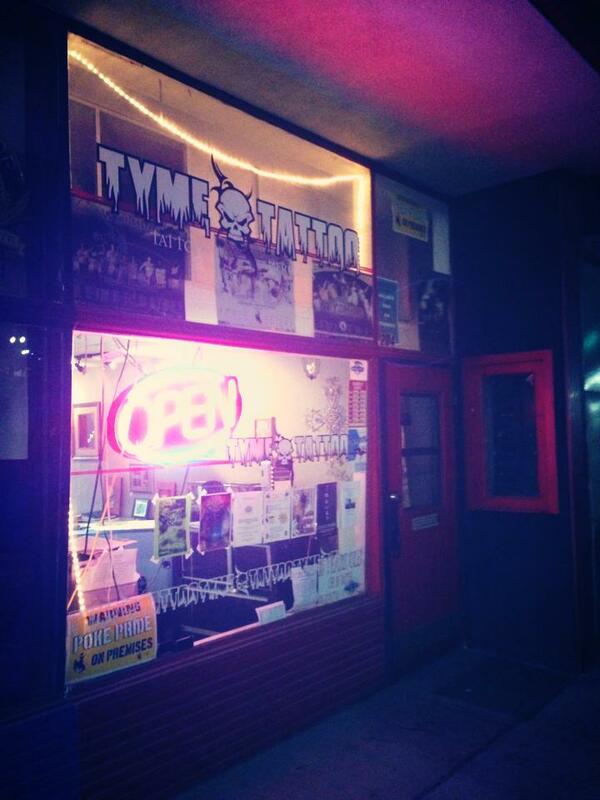 Tyme Tattoo is located at 204 S. 3rd St. in Laramie, Wyoming and is famous for bringing ink art to the town of Laramie. For this assignment we were instructed to work with a partner to create a slideshow that incorporated both photographs and audio. We were given the freedom to choose whatever topic we wanted whether it be a hard news or feature news story. The purpose was to demonstrate the skills we have learned with photography as well as our audio editing skills in audacity, and create a project that exemplified both. In the beginning my partner, Kelsey Tramp, and I had a difficult time deciding on what to do our project on. When Kelsey began talking about her hopes for her first tattoo, we thought it would be really interesting to research tattoos in Laramie, Wyoming. We decided not only to limit it to people who have gotten tattoos done in Laramie, but people here in general that have tattoos. Kelsey had a much better experience working with sound clips in the audacity program, so she decided to do the audio while I loved taking the pictures. We scheduled four separate interviews: one with Dustin Burrowes tattoo artist at Tyme Tattoo, one with Keeley Smith, Claudia Carlson, and Tedder Easton. Both Kelsey and I attended each interview where she led the questions and I photographed their ink. The only time we had problems was during the interview process with Dustin. It was very difficult for us to get answers out of him. He was very vague and very short, but Kelsey continued to ask him questions so we had something to work with. Once the audio was edited and complete, and the photographs were downloaded, all we thought we really had to do was upload them into the soundslides program. However, it was a lot more complicated. When we tried uploading the data it would not work on our school computers. Rather, we had to download the demo version on our own computer and complete the project from there. I then uploaded both pieces into soundslides and proceeded to edit the order of the photos to match the audio, as well as add captions to them. I would have to say the most difficult and time-consuming part to this editing piece would have been determining the length of the photos and how long they would last to match the audio. After we completed our soundslides project I would have to say there is nothing I would go back and change. I was very pleased with how well our project turned out and I definitely think it reflects all the hard work we both put in to it. For my individual soundslides project I would advise myself to take a lot of photos and audio. It is better to have more to work with than not, especially when you are trying to mesh the two together.